Love these! I just bought a pair. I love #3. I might have to get those too! How cute are those whales? Love! I so need those boots with the whales!! So cute!! all three of these are so adorable! love the shoe ones! 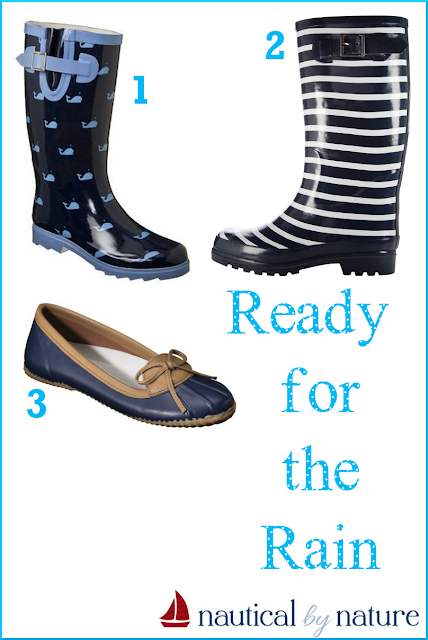 im intrigued by the flat rain shoes as well! The whale boots are too cute!! I have Hunter flats like those Target ones in green and LOVE them. Sometimes boots are too hot in a summer storm! So sweet to think of you going through puddles with the little guy. How sweet! I am a big fan of the LL Bean boots (the ankle-height ones) which I guess the Payless ones are based off of. Perfect for warmer weather! I could definitely go for all of these right now!